Mr. James Robert Reasonover, age 83, of Alexandria, TN, passed away on Wednesday, November 28, 2018. Mr. Reasonover was born in the Sykes Community of Smith County, TN, on march 11, 1935, the son of the late James Ernest “Stokes” Reasonover and Ruth Kyle Reasonover. 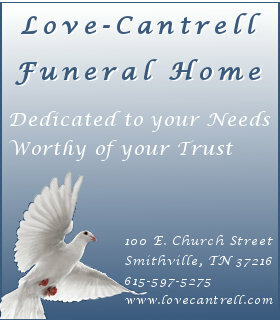 He was a 1956 graduate of Gordonsville High School. Mr. Reasonover served his country in the United States Air Force for four years. He worked for TRW/Ross Gear for several years until his retirement. Mr. Reasonover was a member of the New Hope Baptist Church. He married Jean Parkerson on July 11, 1964. Mr. Reasonover is survived by Wife of 54 years; Jean Parkerson Reasonover of Alexandria, TN. Two Sons; Larry Reasonover of Thompson Station, TN, and Robby (Rachel) Reasonover of Chapel Hill, TN. Four Grandchildren; Andy Reasonover, Katie Choi, John Reasonover, and Micah Reasonover. Sister; Marion Winfree. Nephew; Brice Winfree. Two Nieces; Freda (Chester) Jordan and Sandra Dowdy. A host of friends and family also survive. Funeral Services for Mr. Reasonover are scheduled to be conducted from Avant Funeral Home onFriday, November 30, 2018 at 2PM with Bro. Ricky Scruggs and Danny Parkerson officiating. Interment will follow in the New Hope Cemetery. Visitation with the Reasonover Family will be at Avant Funeral Home on Thursday from 12 Noon until 8PM and on Friday after 10AM until service time at 2PM. 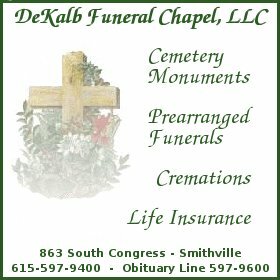 In lieu of flowers, the Reasonover Family requests memorials be made to the New Hope Baptist Youth Fund, New Hope Cemetery Fund c/o John David Foutch, Dekalb West Basketball Program, Alexandria Dekalb County Fair, Tennessee Oncology Foundation, Avalon Hospice Services, or the charity of your choice.